SHOULDER HEIGHT: M - 49" F - 47"
The Gemsbok is a very striking animal with dramatic features and long spear like horns. It has a thick horse like neck with a short mane that runs from the head to the shoulders and a compact, muscular body. The distinctive black and white markings on their face's are said to have contributed to their name Gemsbok, given to them by the Boers, which means chamois. There is white around the nose and mouth, black on top of the muzzle, which joins a black band that runs from in front of the ear through the eyes to the middle of the lower jaw. The ears end in a black tip and there is a narrow black stripe down the spine, a black patch on top of the rump and a black tail. There is also a black band that separates their gray-fawn colored flanks and the white under parts. All four legs are black on their top half, with white below the knees and black patches on the shins. Males and females are difficult to tell apart. Both sexes have horns. Their horns are long and extend straight back from the head and diverge rather widely at the tips. Female horns tend to be more slender and slightly longer than males and are sometimes curved and more parallel. 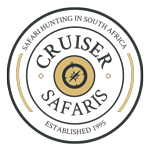 The tips are pointed and sharp and native Africans have used the tips for spear points. The horns are ringed but are smooth near the tips. The horns of the calves grow extremely fast and when they emerge from concealment after birth their horns are very evident. This has lead to the myth that a Gemsbok is born with horns. The Gemsbok has adapted to many areas that most large mammals are unable to live in. The Gemsbok prefers the arid and semi-arid open grassland, scrub and light open woodland. It is very adapt for desert and semi-desert life with the ability to go for extended periods without water. Occasionally they do penetrate deep into savanna woodlands searching for new feeding grounds in the more open areas within them. 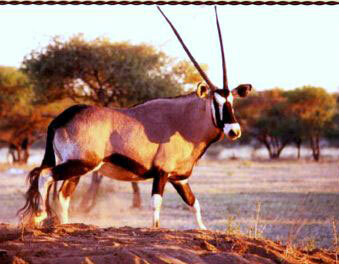 The Gemsbok is mainly a grazer, feeding mainly on the sparse dry desert grasses. If grass is not available they will browse and dig for roots. They will drink water if available from waterholes and streams but can survive days or even weeks without it. Gemsbok feed early in the morning, late in the afternoon and on moonlit nights when the water content of the plants are at their highest. They will also eat wild melons and such for their water content. Gemsbok form mixed herds typically consisting of 10-30 animals. Both sexes are ranked on the basis of age and dominant characteristics and led by a territorial male. The absolute dominance hierarchy makes the territorial male much more tolerant of other males than between males of other species. As calves in the herd grow they test each other in what looks like games, but in reality are tests of strength. As the hierarchy becomes established, the need to fight is reduced. Bachelor herds are rare. Only territorial males breed. Herd composition in the wild constantly changes with some that want to drink, for example, form a group to go to water while females with young form a group that moves more slowly. Herds may number 200 or more during the rainy season, with the herd breaking into smaller groups during the dry season. In marking his territory the territorial male exhibits a ritual of crouching low and depositing dung piles so the pellets don't scatter, thus retaining their odor longer. Gemsbok have excellent eyesight, hearing and smell. They are swift runners able to outpace a horse and packs of hunting dogs. They don't shy away from big animals of prey. The sharp pointed horns are lowered parallel to the ground and the animals lunge with great accuracy when holding off Lions and other predators. Herds bunch around calves if Hyenas are detected. There is no specific period in which Gemsbok give birth. Since most Gemsbok live in dry climates, typically breeding is year round. Calves are born throughout the year with a peak in August and September. Females leave the herd to give birth to a single calf. Calves stay hidden for a period of 3 - 6 weeks before the mother and calf rejoin the herd. The black markings begin to appear and the horns are already developed when the calf joins the herd. Thefemale Gemsbok comes into heat again shortly after giving birth.